After more than 70 years, the Webb Memorial Trust will close at the end of 2017. This follows a decision in 2010 to spend down the endowment of the Trust with the objective of leaving a legacy worthy of Beatrice Webb. 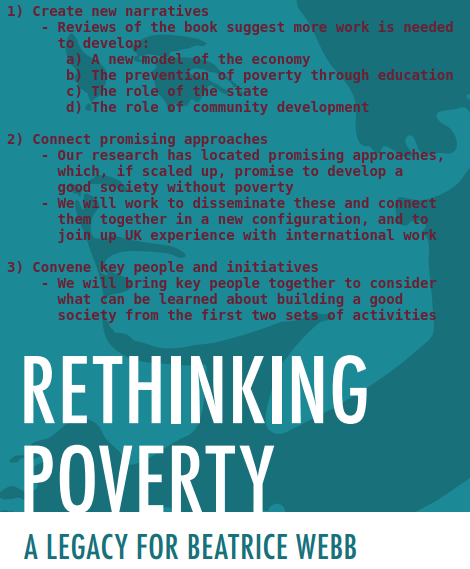 The results of that endeavour have resulted in many initiatives and a book, Rethinking Poverty, which summarises the recent work of the Trust. Reports from individual items of research can be viewed on the website under ‘Publications’. Despite the closure, the work will continue as a follow-up project called Rethinking Poverty: The Webb Legacy. This will build on the work undertaken and develop work in response to the extensive reviews of the book, which – although positive – point out important areas for further work. We will be in touch early in 2018 to give more details on the above and how you can become involved.